10 inch 78 four record set. 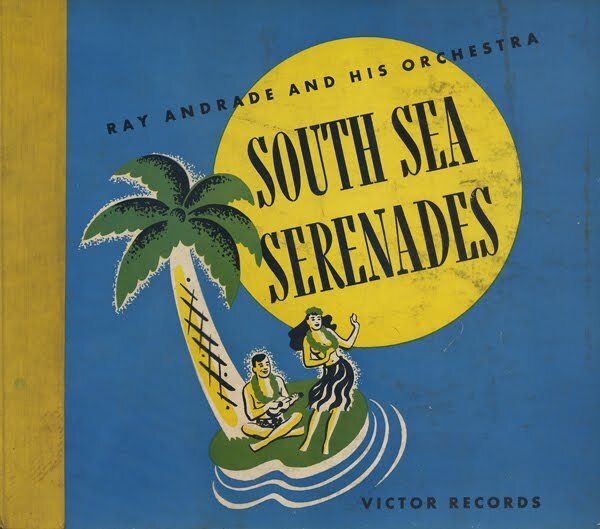 Apparently Andrade handled RCA distribution and merchandising in Hawaii. Advertised, on the back jacket, as Renaud's first album in English. 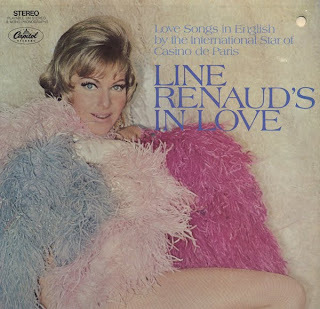 Renaud is a well known French singer/actor who made a number of recordings. She also has a long list of film credits to her name. I can not find mention of this Capitol album online. 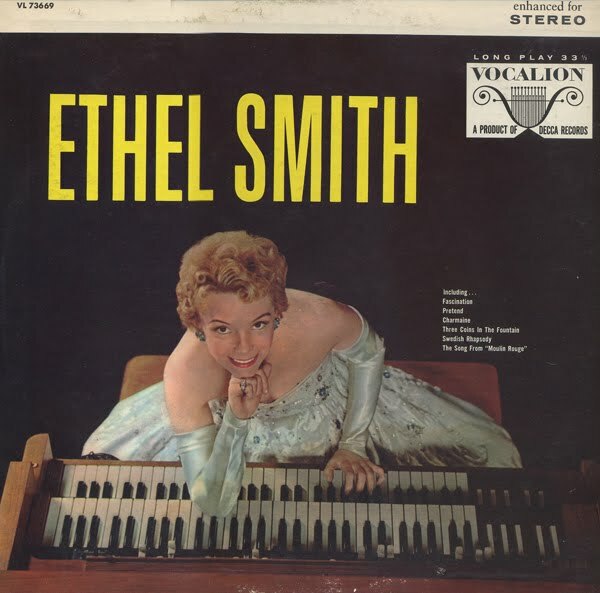 I think she made this LP when she was in Las Vegas doing a show at The Dunes (1963 to 1965). There is one humorous item from the back cover and a list of quotes: Columnist Paul Price in the same paper (Las Vegas Sun): Line Renaud is absolutely sensational. Any able-bodied male who does not fall into instant love is an idiot. A nice space age organ piece from Ethel Smith. 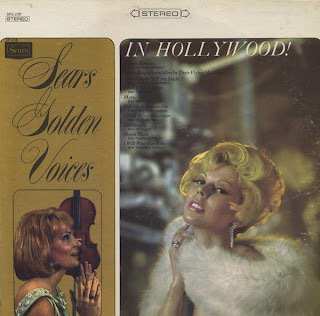 Sears Golden Voices In Hollywood! Back in the day when you could buy anything from Sears, including self-produced vinyl! There is very little information to be found on this record. In fact, today, I can't even find another image of this album online. Maybe THIS record is the most obscure find ever? How could this budget gem have remained hidden this long? From the back cover: Take the best professional singers you can find along with the Broadway beat. Add a top choral director to the blend them into an ensemble, and supply him with arrangements prepared especially by leading Broadway and Hollywood arrangers. Then take your group into the best equipped recording studio you can find. Spend a day – two days, if necessary – tampering with the controls until you've got everything just right. Then cut a record. You'll find the result in these grooves – a superb blending of some of America's best voices in a sound we guarantee you'll find breathtaking. 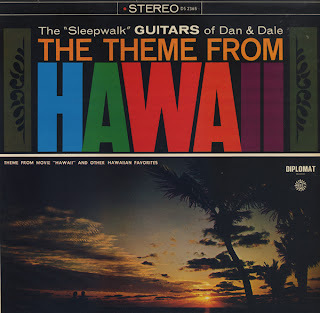 The music on this album is pretty straight forward mild space age flavored 60s flavored easy listening "Hawaiian". But there are a few whacky surprises to be heard. 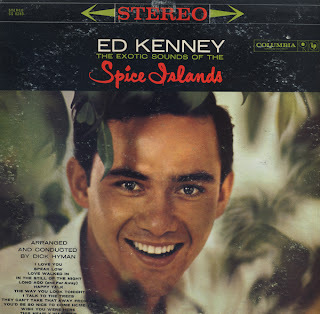 I resisted buying this album because I didn't know if I could take could take male vocals featured on an exotica recording. 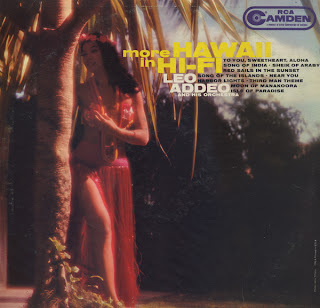 I thought about it and, aside from Hawaiian folk music records, I don't have any exotica albums that feature male vocals. The music and the arrangements are very nice and there are bird sound effects to be found in abundance. Columbia should have left the LP as an instrumental. I'll probably catch grief for this, but Kenney's style of vocals simply do not blend well with the exotica form. 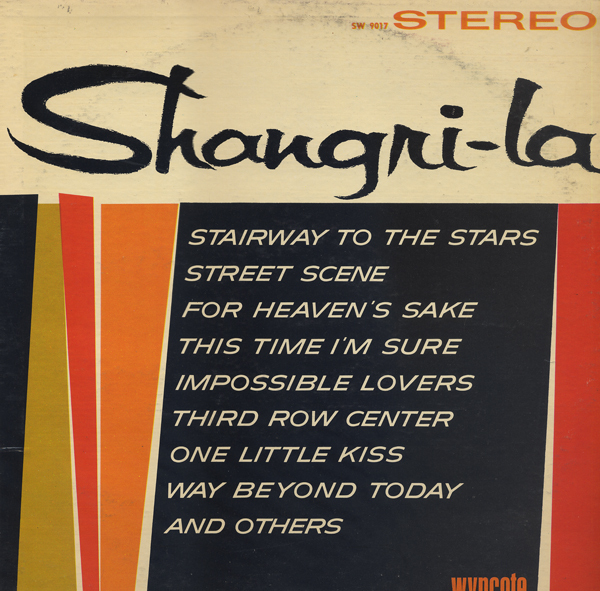 Here's a recording from 1964 that sounds like it could have been recorded in the 50s. The jacket art also smacks of late 50s, early 60s design. Very little information can be found on Jack Weigand, the organist. Apparently he made at least several albums. 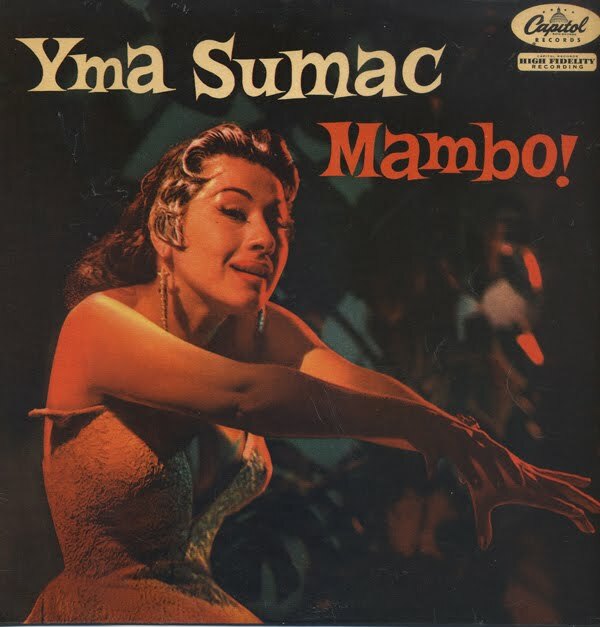 This record is lounge and something you might hear in an exotica strip joint. From the back cover: Please, don't play this album until you have read the following suggestions... Clear your mind of all the events and worries of the day. Tonight is going to be your night, the most special night of all. Draw the drapes... chill the wine... build a fire in the fireplace, a big one, for it's going to be a long, relaxing evening. After your bath... light the candles, open the bottle of wine... (notice how it sparkles in front of the burning hearth). 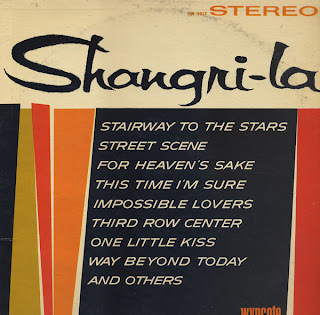 Now, take this record, put it on your phonograph and settle down on the couch in front of the fireplace... the mood is set and you are one (yes... one) your way to your "SHANGRI-LA". TWO copywriters are credited for this masterpiece. This album is Addeo's follow-up his first LP on Camden titled Hawaii. 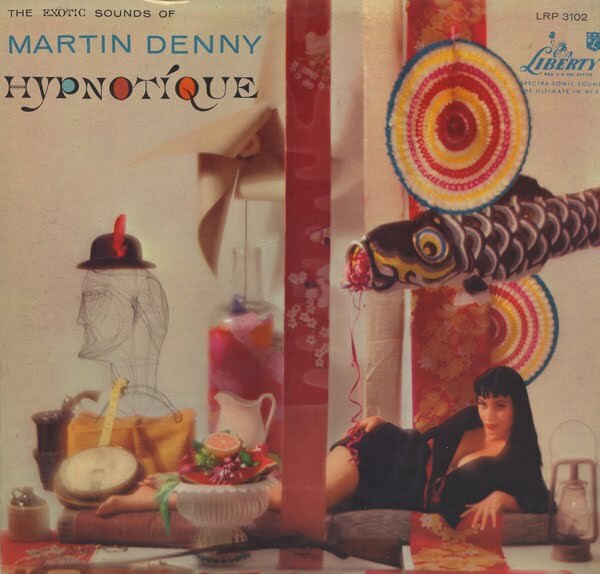 1960s easy listening with an occasional touch of jungle drums to help hold your interest. Along with a record titled Cinco Lations, this record was the first in a new line of export records designed by Columbia for the South American market. The list price was $3.98. Selections were taken from the catalog of the International Division of CBS. The set, for the most part, plays all instrumental and has a modern (for the late 50s) vibe. Some tracks are almost comical. Check out the sample I've posted featuring the kazoo and mouth harp. Great! I bought this album because of the great cover art. I can't find any reference to the title on line. Or, at least, no references with information in english. The record is a 12 inch 33 1/3. I think from the early 60s. I believe this is a compilation LP. I choose one track that seemed to stand out from the rest. 10 inch 33 1/3. This record is outside of what I collect. But I post it because I can't find an image of this album cover online and thought Garcia enthusiasts might find it interesting. Digno Garcia was born in the city of Luque, Paraguay in September 22, 1919. He started playing the guitar at a very young age. By twelve years old he was already a very proficient guitar player without having any formal musical instruction. Soon after, he also thought himself how to play the Paraguayan Harp (Arpa Paraguaya). When he first began playing the harp he was part of various music groups. He played with other accomplished Paraguayan harpists such as Tito Fernandez, Ignacio Melgarejo, Demetrio Ortiz. He then became part of the well known group, Guaireno de Gumercindo Ayala Aquino. As part of this new group, he toured throughout Latin America for the first time. In 1942 he formed the trio, Los Paraguayos, which also included Augustin Barboza and Luis Alberto del Parana. In 1944 he created his first composition Cascada, inspired by the time he spent admiring a waterfall in the town of Chololo Paraguay. This composition later became a standard piece for all Paraguayan harpists. 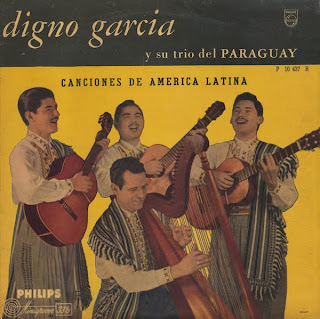 By 1954 the Paraguayan government decided to sponsor the trio as a sort of cultural representative of Paraguayan folkloric music to Europe. When this mission was over, Digno Garcia formed yet another trio, this time called, Digno Garcia y sus Carios. With this group he began recording what would be a long series of albums. They played traditional Paraguayan folkloric pieces, as well as many compositions by Digno. Many of the albums that followed went on to be marketed and sold not only throughout Paraguay, but in more then fifteen other countries. Digno played in over forty five countries. In 1962 he moved to Belgium. Some of his most prominent fans included King Baudouin I of Belgium and the Spanish artist Salvador Dali. He received many honours and awards at home and abroad. In his hometown he was presented a gold medal naming him a Distinguished Son of the City of Luque. And in Barcelona he received a trophy from a Spanish recoding company (Belter) for his composition Costa Brava. After recording 8 albums, of all which included numerous original compositions, Digno Garcia died in 1984 in Belgium. 10 inch 33 1/3. Foreign language record I picked up today. Recorded by Corporation De Radio De Chile. 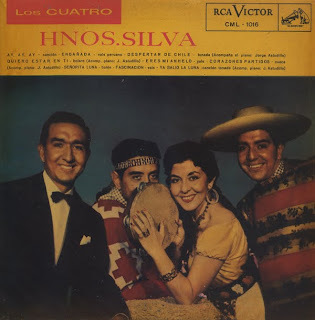 Curious cover image with one member of the group half hidden by the tambourine. Sorry that I can't translate the jacket notes for you. 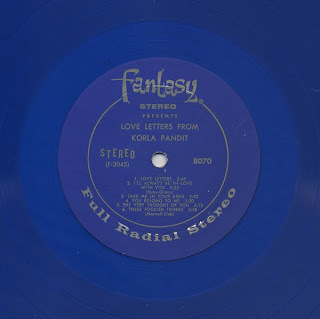 For the most part, the record consists of folk music with a bit of a pop edge. Check out the lounge flavored track above. Sweet! 10 inch 33 1/3 LP in a flimsy cardboard jacket. I've said this before... in 1955 Sumac must have sounded like a creature from another planet to most of the record buying public. She is still a creature from another planet compared to modern day performers that I know of. 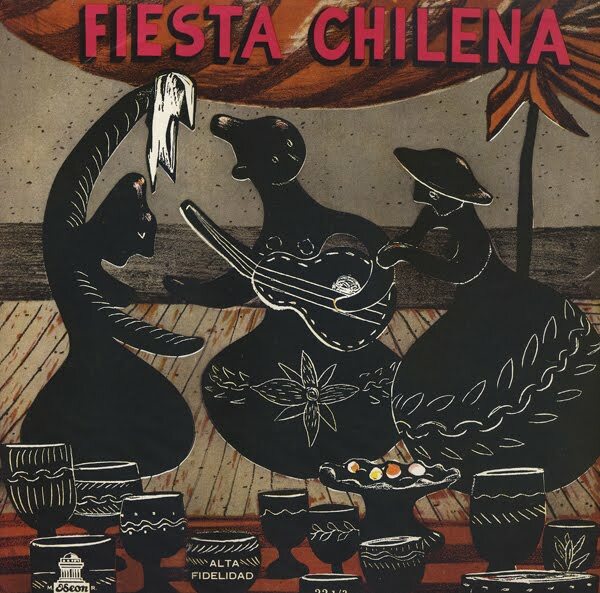 This record, in my opinion is an early exotica album with vibraphone, jazzy brass and space age percussion flourishes blended with Latin folk music. 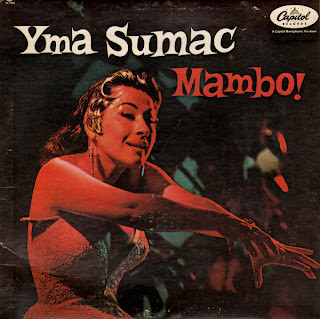 The lead track on the A side, Bo Mambo is really freaky. This is one great record! I picked up a 12 inch copy today. This is an "abridged" version that apparently includes additional tracks from the session. For the best cover art pick up a copy of the 10 inch. The cover on the 12 appears to have been photographed and enlarged. It's a bit raw by comparison. This is a another terrific exotica offering fron Lyman. 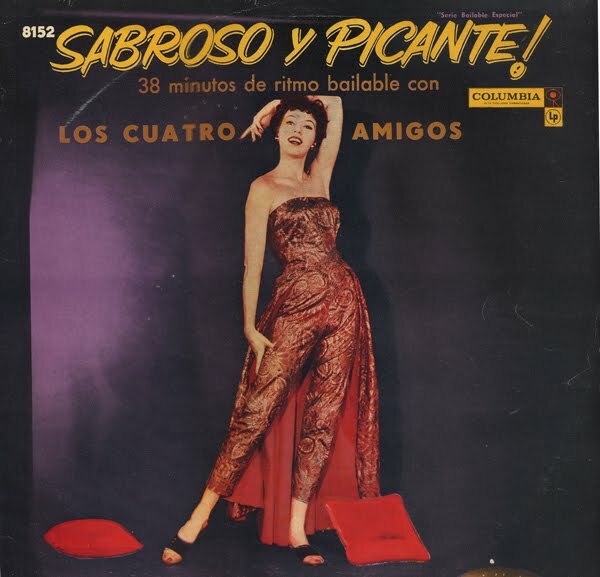 Carabunta, a track found on the A side, is pure exotica. Lyman's cover of Blue Hawaii is one of the best I've ever heard. The arrangement is sparse and driven by a unique percussive line. 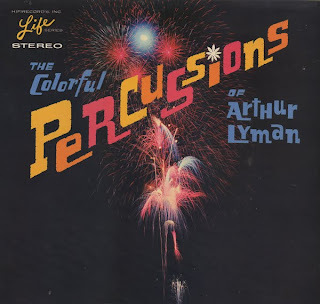 The lead in on the song Aloha No Honolulu is also catchy with Lyman's vibraphone accompanied by a deep bass tone made with a bow. Covers of Exodus and Never On A Sunday are more standard Lyman fair, but still heads and tales above most. Other stand out tunes are Tangi Tika where a flute replaces the vibraphone as the lead instrument. Geisha Waltz is highlighted by sparse "Japanese" influenced percussion. The sixth record for Denny on Liberty sports one of my favorite Denny covers. The music is also stellar exotica. 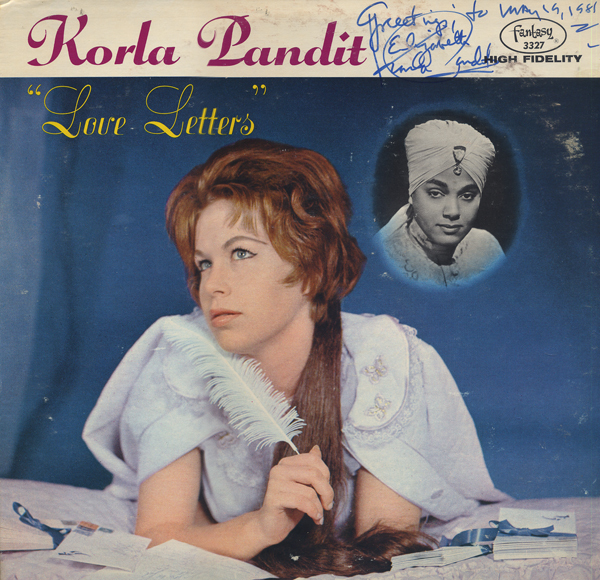 On this LP, Pandit is accompanied by Arthur Bergman on the guitar. 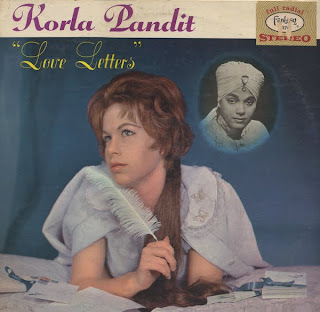 I think the model on the album cover is Pandit's wife, Beryl. She would have been 40 years old when this album was released. 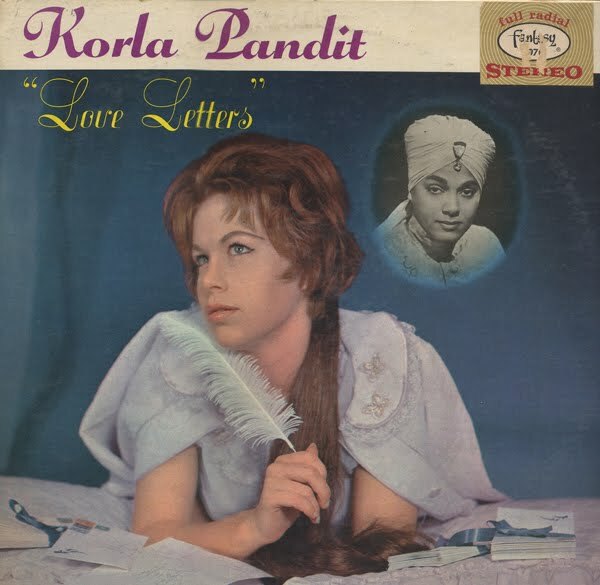 This album is slightly more traditional sounding than the other Pandit recordings I currently own. But the addition of the guitar was a wise choice and helps to create lush light jazz mood throughout the LP. Here's a mystery. 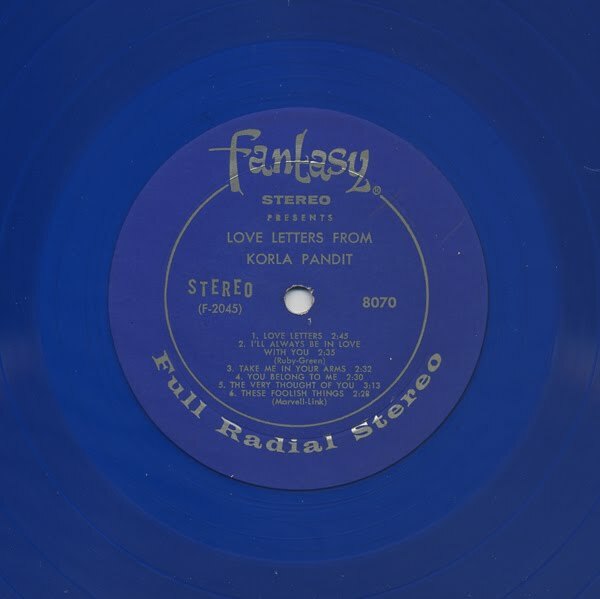 I found another copy of Love Letters, as pictured above with a slight cover variation (the fantasy logo is different). 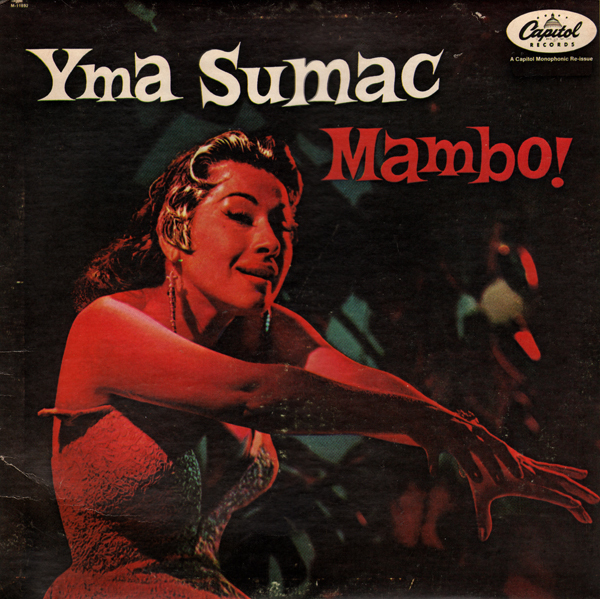 The record is black vinyl and the label is obviously a later design. I love how Pandit apparently dated everything he signed, so we know this record was released before May, 1981. 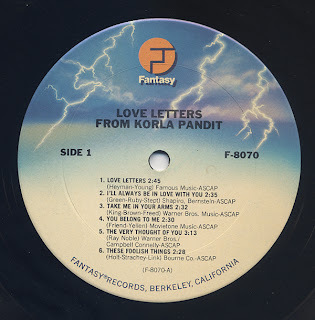 But this record doesn't appear on the Pandit Discography as found on the website dedicated to his memory. This has to be a later pressing even though the cover has all the appearances of being designed and earlier than the late 70s or early 80s (the label design screams 80s if you ask me). Great space age exercise album with fun music backing up the instructions. 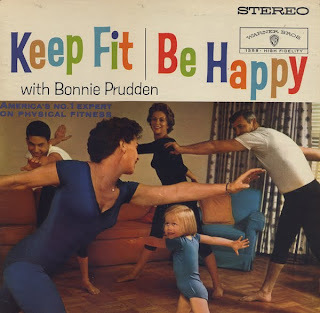 Apparently you can't exercise as a family unless everyone is wearing funny outfits. Those crazy atomic age workouts! Soundtrack from a great budget Roger Corman film. 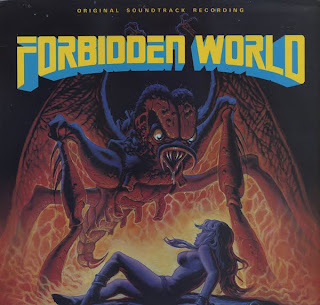 Amongst the more standard 80s sounding electronic there is some great creepy music. Especially the second to last segment found on the B side. 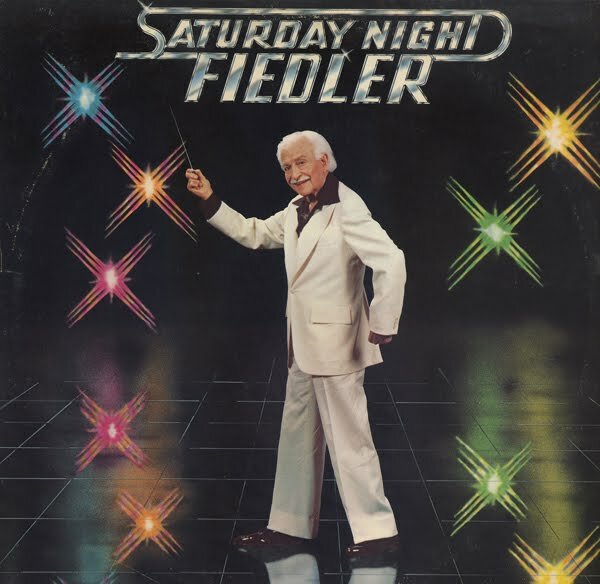 Arthur Fiedler (pictured on the album cover), conductor for The Boston Pops Orchestra, is pictured above in his Saturday Night Fever John Travolta suit. From the back cover: I wish you the joy of listening and dancing to the first disco record with the Boston Pops. Basically, this is a record of the orchestra doing it's thing with that annoying disco beat driving the music on and on and on throughout the entire recording. Never stopping for one single instant. 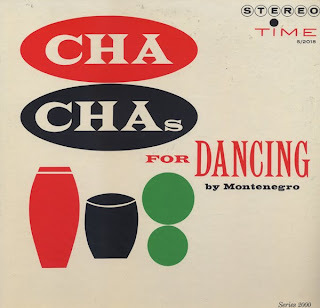 Terrific space age big band Cha Cha record by Hugo Montenegro. 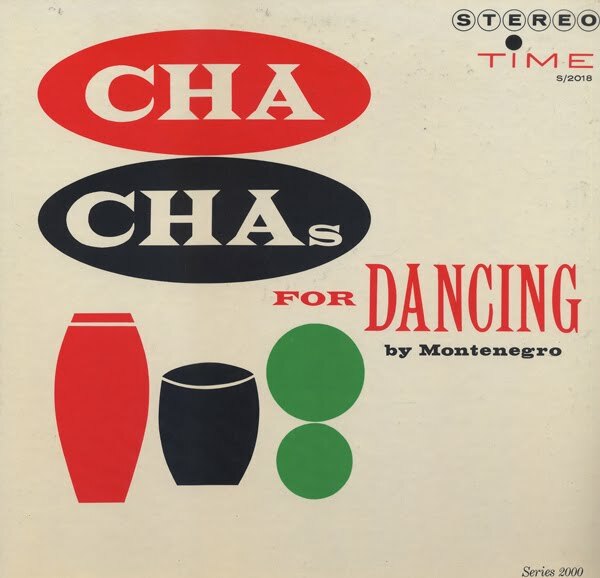 Montenegro would go on to make a number of trend setting records using the moog which influenced future generations of electronic musicians. He also scored the main theme to Sergio Lenone's film, The Good, The Bad And The Ugly. The jacket is a book-fold design influenced by Enoch Light's Command Label who created a style of book-fold jackets that featured minimalist art on the covers. I also have this album issued a single jacket. Doing a search for Pupi Lopez returns almost no information. There is no information on the back cover. Songs from this LP are available by the download on iTunes, so I'm assuming someone renewed the copyright at some point. 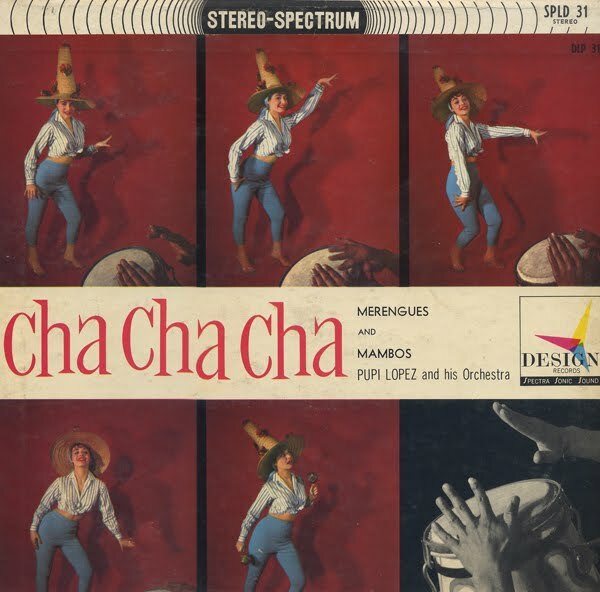 This is a great space age Cha Cha record on a budget label. A number of tracks rise above the norm with the addition of clarinet, flute and accordion flourishes.